Sure July typically reminds us of Red + White + Blue, bright summer colors and lots of sun. However, I am in the middle of redoing my office and I am trying to draw inspiration from blank palettes, since my art work is pretty bold. 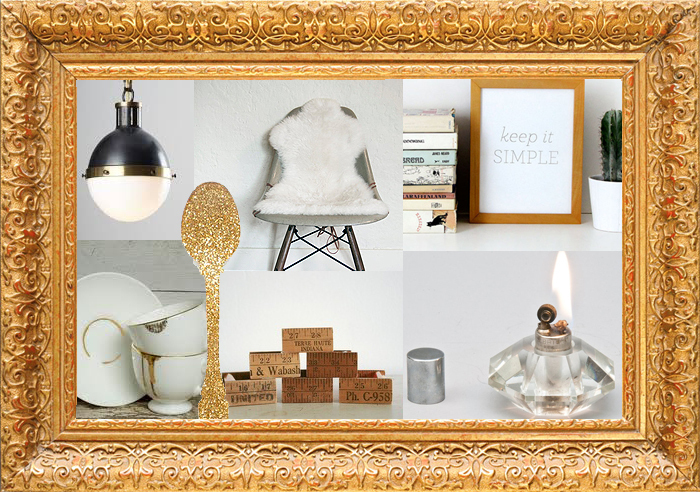 My idea is to keep things simple everywhere except my walls. Even that, though, is going to stay within certain parameters. Let me just say that there is nothing fantastic about the overhead lighting in the space right now. Not how it looks, but the fact that it gives off hardly enough light to even see that I have a light hanging from the ceiling. Unless you want to feel like you are in an interrogation room with a beam of light shining down in the middle of the room, this is probably not the best option for an office space. My lighting crush is the "Hicks" Pendant Light by Thomas O'Brien for Visual Comfort. I imagine if the black & bronze version was hung in my house, I would sit and stare at it for a long while with a ridiculous smile on my face. Sadly, Horchow's 10% discount doesn't even help put a dent in the price, but a girl can dream, right? Scouring the internet for ideas is never complete without adding bookmarks of fun things to add to the house. A few of my favorites right now are lighters created from little vintage perfume bottles, business card holders made out of old rulers, delicate little tea cups with gold foil lip marks on the rim, and tulip chairs with custom sheepskin covers in a creamy color scheme. Of course, life would be boring if everything was plain and simple - why not throw in glitter spoons for a little fun. How do you draw inspiration when you want to re-design a space? Do you prefer to keep things simple or are you drawn to bolder color schemes?